Continuing with our series spotlighting one of the Steenbergs key products. Harissa is the staple spice for North African cuisine and adds a good kick of spice and warmth to your meals. Harissa is most commonly used for soups, stews and even a spice rub for meat and fish. Like the Steenbergs blend, rose petals are also a common addition and add a flamboyant touch to your dishes. A little does go a long way so if you prefer a slightly milder flavour you can control it easily by adding a little less but still getting that warming and savoury flavour which is characteristic for this lovely blend. It’s a hot blend of organic crushed chillies coming together with organic caraway, organic coriander and organic cumin, a true slice of North Africa wafting into your kitchen. 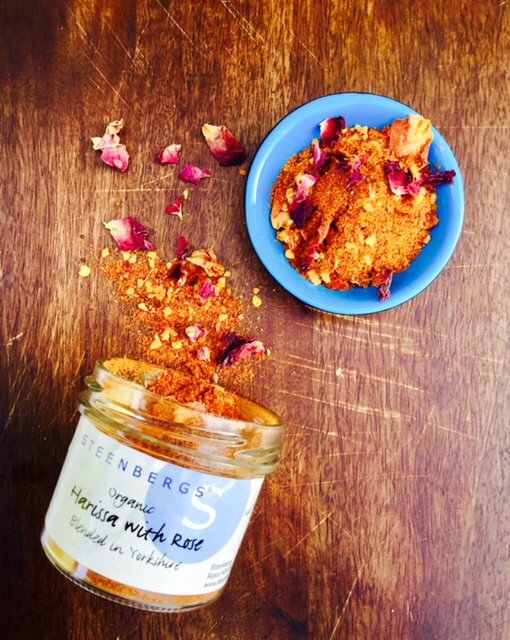 Steenbergs Organic Harissa with Rose Spice Blend, created and blended in North Yorkshire. These fritters are delicately flavoured with the Steenbergs Organic harissa with rose and are quite easy to make. They are perfect for picnics or a light brunch served with a couple of poached eggs and a light garden salad. 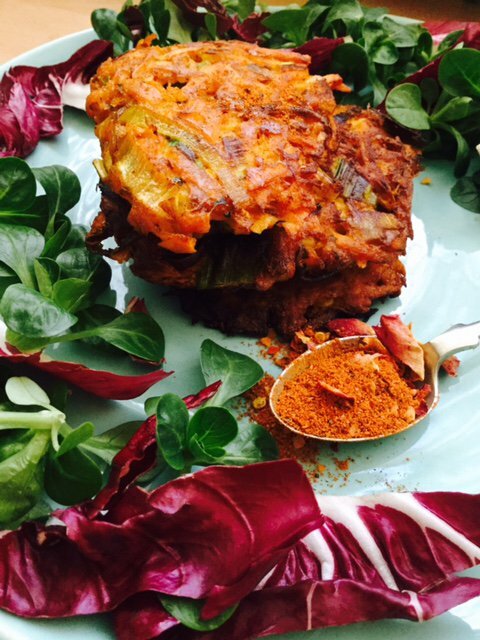 Recipe for Harissa with Rose spiced fritters. In your mixing bowl add in the grated sweet potatoes, spring onions (or red onions if using) and mix well with your all purpose flour, use a wooden spoon for this so it’s evenly dispersed. Crack in your eggs one by one and using your spatula mix well until the mixture comes together. At this stage add in your lovely harissa with rose, smoked paprika and seasoning and whisk again until it’s all well dispersed into your mixture. Heat your frying pan over a medium high heat and melt your coconut oil. Fry your fritters using your tablespoon for measuring them out evenly. Fry on each side for a couple of minutes or until the edges start to go golden brown. These gorgeous fritters are wondering with some sliced avocado as well with extra harissa with rose sprinkled on top, a double whammy of flavour!